From C-Tec comes the new revolution in heavy duty bonding; CT1 Power Grab n Bond, an all purpose vertical bonding adhesive designed for the toughest jobs, CT1 Power Grab n Bond is based from C-Tecs winning CT1 formula, with a much higher density and no solvents. Power Grab n Bond is the ideal one-stop product on your job site or DIY toolkit for all vertical bonding applications, and its powerful initial grab and rapid curing properties will reduce labour time in most applications by at least 50%. 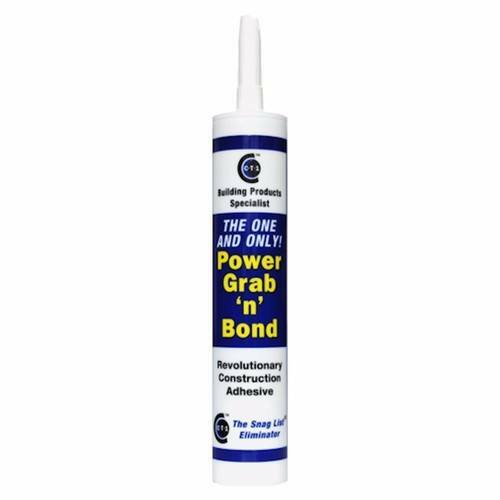 Power Grab n Bond can bond virtually any material including Stone, granite, metals (including alloys) glass, and most plastics, in any combination of suitable materials, giving you an endless list of possibilities with this true super-strength product. Power Grab n Bond was designed initially for facade application as a powerful adhesive with none of the drawbacks of conventional epoxy mixes, such as the need for additional fixings, supports, and the long curing time. Power Grab n Bond has none of these disadvantages, and is sure to be an invaluable product for any tradesman or DIY enthusiast. Tensile strength fully cured 22kg / cm². Shear strength fully cured 11kg / cm². Good: Water,seawater, aliphatic solvents,oils,greases, Diluted organic acids. Sometimes when you buy something you think...mnnnn maybe the manufacturer are over selling this a little. I took a chance on this that it would do what i needed and it worked great. Heres why i am so happy. The job i needed this for was a repair job on a small island just of Scotland - isle of arran. Which is why i did not want to have to start mixing cement etc. Im a professional trades person and don't do shoddy work so i tested this a few days before i left attaching a 4 inch concrete block to another wall in my own yard. When i seen the result after giving it the required curing time i jumped in my van knowing i could face the job! Great service and what a wonderful and great item does what it says on tin. I must say that I was a bit weary of the claims but need not have been well worth the money. Will use this Inthe future.